As a parent, you will be able to login to the School Life mobile application and/or your school's website, this will allow you to access all of the key information that relates to your child/children. To to this, you will need to login with your childs School Life account first, which then allows you to create your own account. Your childs School Life account details are provided directly from their school. If you have not received this information or would like request it again, please contact the school directly or head over to our Request My Details page. In this example, we will be using our own Demo School to show you the steps. You will need to visit the school of your child to do this. Once on school website, locate the "Login" option from the menu. If your viewing the school's website on a mobile device, you will need to tap the menu icon first. Login with the provided Username and Password for your childs account with School Life. Once you have logged in you will be presented with your childs School Life Account. From this screen, you will be able to change your childs password, view their messages and their current assigned homework. The option you will want to select is "Add Parent/Guardian Account". Important: If you do not see this option, please contact the school. Fill out your own details to create the account. This account will be associated to the child without you needing to do anything extra, as you have already logged in with your childs details. 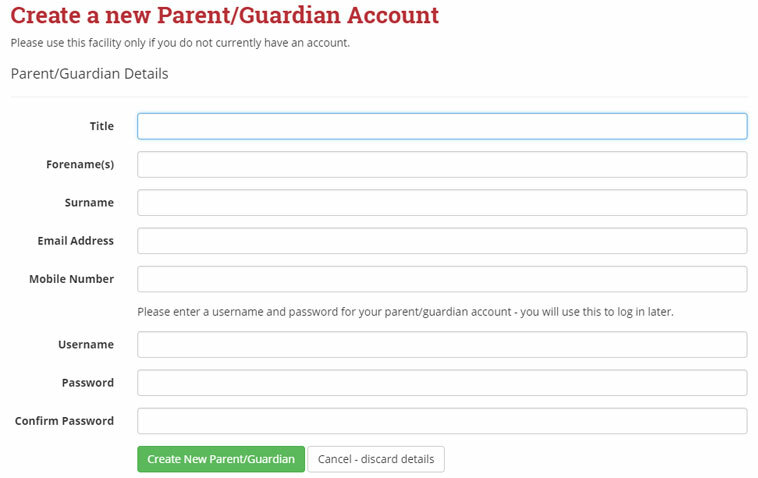 If you already have a parent/guardian account (For example; you already have a child in this school), select the Existing Parent/Guardian option and login with you username/password you have already created. Important: The email address you provide is important if you wish to receive school letters, newsletters and other communications from the school as well as being required for password resets for your account. Now you have your own account set up, which is assocaited to your child, you can now login directly to your schools website to view any communications or download the School Life Official Mobile Application from the stores by tapping on the logos below. I have more than one child, what do I do? If you have more than one child, you should of received a letter from the school for each child. To start, login with one of your childrens accounts, once logged in, create yourself a username/password (see step 4). This account is then associated to that child. Log out, and login with the second childs username/password. Select the Existing Parent/Guardian option, and enter your username/password you created for child one. Repeat these steps for children you have. The end result should be one adult account, that is associated to all of your childrens accounts. This means when you login you will have access to the associated child accounts from one adult account.